Take control of your network, and prevent unauthorized use of USB flash drives. 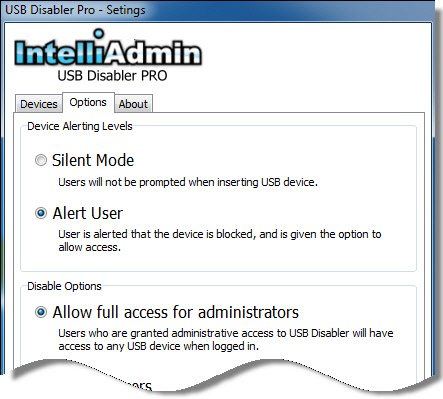 USB Disabler Pro allows you to pick specific users and grant or deny them access to USB flash drives and memory sticks. Stop unauthorized use of flash drives, and memory sticks on your network. Worried that someone will copy sensitive data to a flash drive? 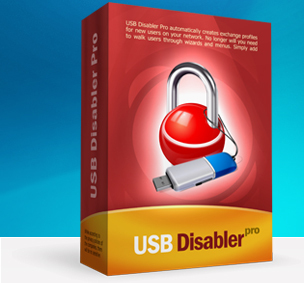 USB Disabler Pro can lock out flash drives without interfering with scanners, cameras, mice and keyboards. Do you want to allow a select number of flash drives to have access? USB Disabler can allow and deny flash drives based on their unique device ID. Need to allow your IT Staff to use flash drives? One license covers an entire company site.